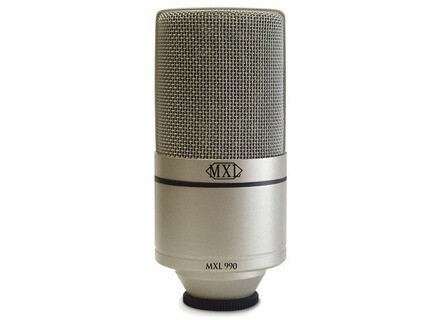 990, Large diaphragm condenser microphone from MXL. An indispensable tool in any studio, condenser mics allows us to record vocals as well acoustic instruments. Today, many brands offer large-diaphragm FET condenser mics for home studios on limited budgets. Here are the results of our survey regarding your favorite large-diaphragm condenser mics under $150/€100. 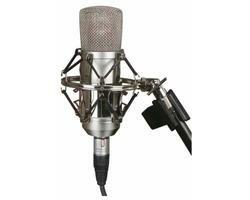 At first place, we start off with a mic from renown Japanese brand Audio-technica, the AT2020. This cardioid mic can handle up to 144dB SPL, weighs 345 grams and has a 16 mm diaphragm. It comes with a stand mount for threaded stands and a soft protective pouch. No suspension. It's worth noting that there are two USB models that come with mic stands, one of which has a minijack headphone output, the AT2020USB+. The Austrian brand AKG is the runner-up in the survey thanks to its Perception 120, which has a 2/3" (1.7 cm) diaphragm. The cardioid mic can handle up to 150dB SPL (with the -20dB pad on) and has an anti-pop filter integrated in the capsule. It also features a low-cut at 300 Hz and weighs 525 grams. 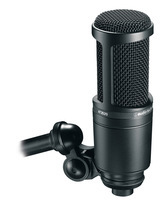 Do note that it comes with a mic clip (no suspension) and that the anti-pop filter is optional. There is also a USB version but without headphone output. This cardioid condenser mic gets the third place in the ranking with its 1" (2.54 cm) diaphragm that can handle up to 132dB SPL. Its low-cut can bet set to 150 Hz or 75 Hz (with a 6 dB/octave slope). The mic features a transformerless circuit and a -10 or -20 dB attenuation pad. It comes with a suspension shock mount, a pouch and an anti-pop filter. This mic manufactured by Apex comes in fourth. It has a cardioid polar pattern, a low-cut at 100 Hz with a 6 dB/octave slope and can handle an SPL of up to 140dB. It weighs 362 grams and its body is made entirely out of metal. It comes with a suspension shock mount, an anti-pop filter and a transport bag. It lacks attenuation and there is no USB version available. The fifth mic in our survey is the MXL 990 in champagne finish. It weighs 544.3 grams, has a cardioid polar pattern and can handle up to 130dB SPL. Its diaphragm features a six-micron gold coating. The mic comes with a nice plastic case, a suspension shock mount and a mic stand adapter, but it has no anti-pop filter. We could name the Behringer B1, Prodipe ST1 and Samson C03 that were ranked 7th, 8th and9th respectively. Our readers also selected the t.bone SC 450 (a brand belonging to Thomann) that also has a USB version.